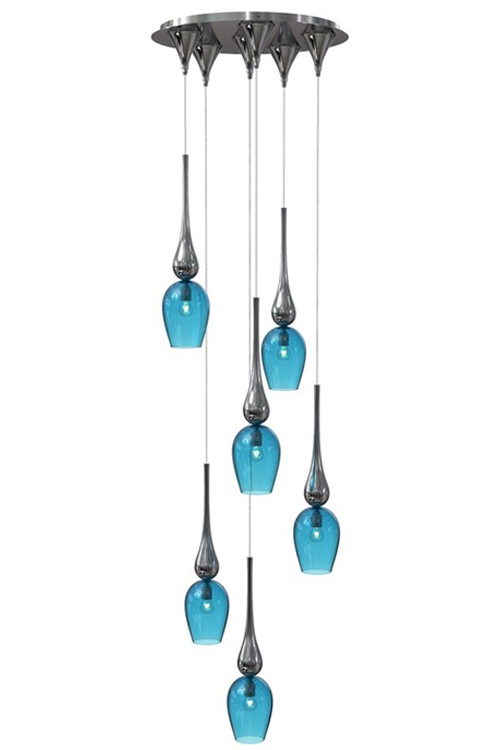 This stunning glass pendant light is an exclusive one-off design made in the Venetian island of Murano, designed by Esther Patterson and the silver stems blown by a master glass blower in Venice. The luxurious glass pendant light features an elegant fluid shape with a tapering hand silvered Stem and Canopy. This elegant pendant is designed to work equally well as a single or small group statement or for opulent impact, grouped within a bespoke chandelier. In a visit to Murano in 2016, Esther was inspired by the work of Fabio Fornasier who is renowned for his refined antique and modern chandeliers that stand out for their innovative design. This piece pays homage to his silvered fluid chandelier designs. Read more about the story here. For the shades there are 23 glass colours to choose from the Curiousa range. Click here to see our options. Thanks for your enquiry. We’ll get back to you just as soon as we can.